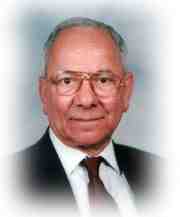 Dr. Sabry Gabriel was a well known figure among the Coptic congregation and the Egyptian community in the UK. He was an approachable gentleman who assisted everyone regardless of ethnicity, religion or race. He passed away peacefully early on Sunday morning 12 June. Dr. Sabry was born in Cairo in 1928. He graduated from the Faculty of Medicine, Cairo University in 1952 and then went on to obtain a Diploma in General Surgery and a Diploma in Urology, both from Cairo University. After working for a few years in the Department of Health Hospitals in Egypt, he travelled to England where he studied and gained the Fellowship of the Royal College of Surgeons of Edinburgh and also the Fellowship of the Royal College of Surgeons of the Republic of Ireland. During that time, he worked in several UK hospitals before returning to Egypt. In 1971 Dr. Sabry travelled to Nigeria to work as a senior Surgeon at Maiduguri’s General Hospital, North East State (as it was called at the time). His close friend Dr. Mahroos Samak, who worked with him in Nigeria and the UK, said that he was very successful, very decent, very helpful, he earned much respect and love from all those who worked with him and who were treated by him. He obtained great popularity and the friendship of some of the most eminent people in the government of Nigeria. After four years of working there, he decided to move to England to pursue his career. It was easy for him to start working in National Health Service hospitals in the UK as he was highly qualified and had a lot of experience. He climbed the ladder step by step until he reached the top when he was appointed a consultant surgeon in the Accident and Emergency Department at Whipps Cross Teaching Hospital, where he remained until retirement. Dr. Sabry was a member of St. Mark Coptic Orthodox Church’s Council in London and lately became its Chairman. He was also a Vice Chairman of the Archangel Michael and Saint Anthony Church’s Council of Stevenage working with the Chairman, H.G. Bishop Angaelos. He always encouraged the establishment of new Coptic Churches all over the UK. Since the establishment of the UK Coptic Medical Society three years ago, Dr. Sabry was the Chairman and then the President of the society. At the same time he was a member of the Egyptian Medical Society and member of the Egyptian – British Society. He was a well-known figure in the Egyptian Embassy, the Consulate and the Culture Department and represented, with his close friend Dr. Fuad Megally, the Coptic Church on many occasions either celebrating Egyptian festivals or honouring eminent visiting officials. Dr. Sabry was married to Dr. Camellia Boutros, daughter of the late famous Counsellor Helmy Boutros. She supported him greatly up until the last moment of his life. Despite her great responsibilities, she gained a PhD in Science from England and is a well-known figure in her field. Dr. Sabry is survived by his son Samy, an electronic engineer, who is married to Reem Bayouk, and his daughter Mona, who is married to attorney Samy Henein of California, U.S.A. The funeral, which was conducted by H.G. Bishop Angaelos representing H.H. Pope Shenouda III, was attended by officials from the Egyptian Embassy in London together with members of the Egyptian – British Society and many others. The soul of Dr. Sabry returned to God the Creator. Our faith is that there is no death in Christianity but a transfer from the world of trouble and pain, to the world of peace and joy.